In our most recent analysis of Alice activity, we discovered that 82.2% of rejections in Class 705 cite Alice, more than twenty percentage points higher than the next closest class. Class 705 is where you’ll find many of the USPTO’s patents concerning business methods and patents for processing data related to finance, business practice or management, and/or cost or price determination. This opens the class up to many of the computer-implemented and abstract ideas that Alice targets. In fact, the patents at issue in Alice itself (application numbers 08/070,136; 09/567,507; 10/331,331; 11/166,387) were all in Class 705. Given its subject matter, it’s not surprising that we found Class 705 to be a hotbed for Alice rejections. 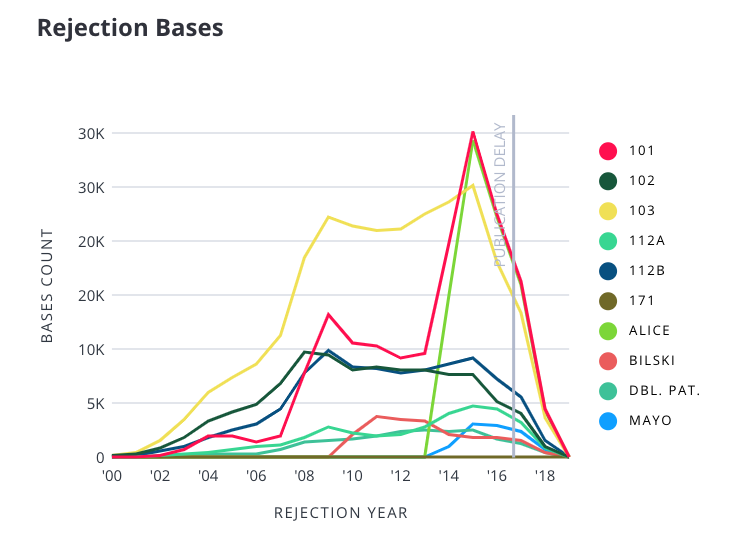 All Alice rejections are categorized as 101 rejections, which, as you can see from this graph available in Juristat Platform, have dramatically spiked in Class 705 following the Alice decision in 2014. Who’s overcoming Alice in Class 705? While Alice rejections may be common in Class 705, there are firms proving that it’s not a death sentence for their applications. We looked at the current key players in Class 705 – that is, firms with 150 or more disposed applications between 2016-2018 – to see who had the best allowance rate for applications with at least one Alice rejection. We refer to this as their Alice allowance rate. These 10 firms saw allowance rates at or above 30% for applications with at least one Alice rejection. Based on our most recent analysis, Snell & Wilmer fared the best, with an Alice allowance rate of 49%. That being said, the USPTO average Alice allowance rate for 2018 was 61% – significantly higher than any we found in Class 705. Luckily for modern IP professionals, big data has brought more predictability to the patent prosecution process and you can now set expectations even before filing an application. Juristat Drafting can help identify your application's likely class assignment, as well as potential art unit or tech center assignments and prior art cited against similar applications. You may find that altering a few words in your claim language can even help you avoid Class 705 altogether. Of course, you must be thoughtful when making changes in order not to lose claim scope or claim something unintended. Arming yourself with this information will help you and your clients approach prosecution with a more clear, strategic plan. Juristat’s database of more than 10 million patent applications and their prosecution histories puts the whole USPTO at your fingertips, helping you identify applications that may be vulnerable to an Alice rejection. Equip yourself with the tools to overcome Alice. Sign up for a demo.